Please copy and paste ' [[Category:Plecos]] ' into the end of your article to include it in this category. The word Pleco was short for Plecostomus, a collective group (genus) of catfish. However over the years fish which were originally in this group have been extensively renamed and are no longer in this group. But fish keepers still call them under this name. There are over 1,000 species of suckermouth armoured catfishes, with new species still being discovered and reclassified month by month. 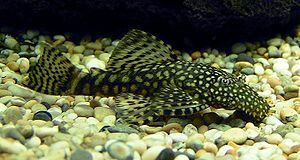 All Plecos fall under the family name of Loricariidae (Lori-Kari-iday) meaning Armoured catfish, and the majority are found in South America. The tell-tale feature of a Pleco is a lack of traditional fish scales (instead, rows of "armour plating") and an underslung suckermouth. On some Plecos they even appear to be hairy! Contrary to popular belief, no Pleco is truly herbivorous, indeed some won't touch algae at all! Plecos are omnivorous and opportunistic. There are several species that actually prefer meaty diets, and may even take small tank mates! In the recent past there was a superstition amongst Internet fish keepers that to type "Pleco" on a forum was bad luck and the fish would die. It was often written as "Pl*co" instead. In the UK, Plecos are often referred as "Plecs".